On January I wrote about South Korea’s Tesco big hit with QR Code shopping concept. Today I spotted in Milan, Italy, a similar idea where an italian discount-hunting website, klikkapromo.it, is promoting several goods along with QR-Code. The idea is simple: just point your smartphone aiming at the QR Code selecting the product, get the product into your shopping cart, pay, get at home what you bought. Advantage is related to delivery, overall costs, quicker selection of several products and more choice to all of us. Of course, there’s a lot more to it than just point-and-click (logistics, web services, security, discount checking and so on). 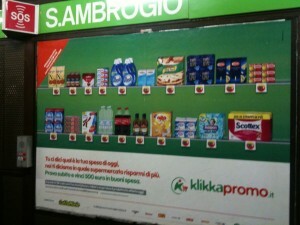 The photo I shot (forgive for low light and low quality) shows the panel in a Milan subway station. Although QR codes are quite small and blurry, they work along any QR-reader and bring the user/client’s smartphone a web page where the discount is explained and, quite useful, the webapp brings you to a list of selected retailers which sport the better discount. Such retailers are selected on the user’s smartphone geo-location and therefore are the nearest – sort of. 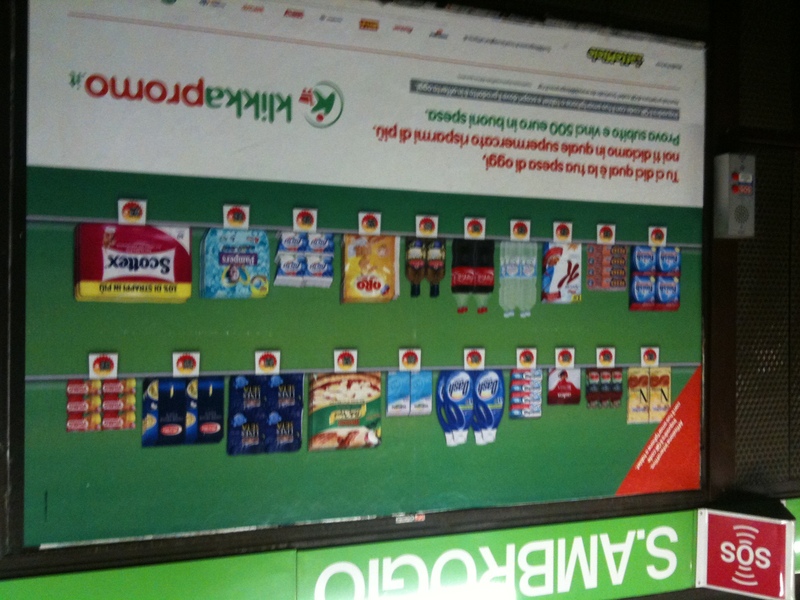 I’m amazed to see this service working in Italy! 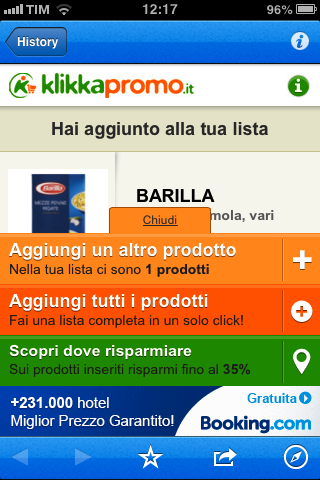 This entry was posted in Business, Business Model, Case Study, Digital life, Digital media, Italy, Marketing, Mobile advertisement, Mobile marketing, Mobile phone, Online shopping, QR Code and tagged Italy, klikkapromo.it, Milan, Online shopping, QR Code, qr shopping, Shopping. Bookmark the permalink.